The water situation in Cape Town - Day ZERO has been avoided! Is there water in Cape Town? According to a recent media statement day zero has been avoided for the time being. 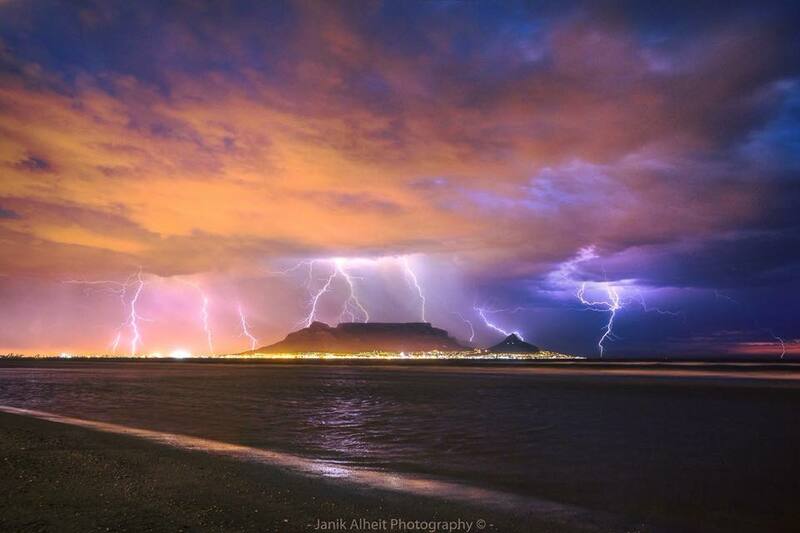 Recently, we were lucky enough to have a thunderstorm pass over Cape Town and this wonderful shot was captured by photographer Janik Alheit. Since this photo was taken, we have also had sufficient seasonal winter rains to avoid Day Zero. Day Zero – 4 June 2018 9 July 2018 Avoided! It looks like things have been pushed out to at least 2020, so well done Capetonians for your efforts! Even though we have avoided (for the time being) a dire situation, that does not mean that we can be wasteful with the water we have as we are still under water restrictions. Tap water is still perfectly drinkable in Cape Town and is still of great quality. You don’t need to have any concerns about using tap water for drinking or cooking while you travel here. Do not take baths – while strictly speaking it’s not illegal, taking a bath uses much more water than taking a short shower, so we advise guests to be mindful. This doesn’t apply to small kids, so we understand if you need to use the bath for toddlers and infants. Keep shower under 2 minutes – usually this should be pretty easy to achieve. Don’t leave the tap open when brushing your teeth, or to wash dishes. Rather close the tap and use as needed. Don’t wash your rental car using a hose. Don’t water gardens using a hose. Most self-catering accommodations will provide buckets to catch water during your showers and will be most appreciative of you watering their gardens with that grey shower water. Only flush toilet when necessary – if it’s yellow, let it mellow! Don’t wash off your wetsuits and gear with a hose when you come out of the ocean. Just gently brush off your feet with a towel to avoid stepping sand into the accommodations.